The new BMW 7 Series will have two Plug-in Hybrid versions, with an all-electric range up to 36 miles, and up to 141 mpg (based on the new WLTP test cycle but then adapted to NEDC). There’s a choice of two model variants: the BMW 745e and the BMW 745Le xDrive, the latter of which gets intelligent all-wheel drive. The 7 series plug-in hybrid system consists of a six-cylinder in-line petrol engine and an advanced high-voltage battery with an enlarged capacity compared to previous plug-in models. This gives a boost in power output and torque, as well as improved figures for electric range, fuel consumption and CO2 emissions. In performance terms, the 745e accelerates from zero to 62mph in 5.2 seconds. The new 745Le xDrive, with its intelligent four-wheel-drive, cuts that time down to just 5.1 seconds, with all models electronically limited to a top speed of 155mph. The new high-voltage lithium-ion battery for the plug-in hybrid 7 Series has an increased capacity of 12.0kWh, allowing electric power to be enjoyed beyond the city limits. In HYBRID mode, all models can travel at a speed of up to 68mph – 13mph faster than the predecessor models – in purely electric mode. The petrol engine doesn’t join in until the car reaches the higher speed, or the engine is under particularly heavy load. In ELECTRIC mode, the power of the electric motor alone is sufficient to reach a speed of 87mph. Fuel consumption and emissions have also been improved. For the 745e, combined consumption is between 141-123mpg on the NEDC cycle. CO2 emissions are from 48g/km. The corresponding figures for the new 745Le xDrive are 118-105mpg and CO2 emissions from 52g/km. 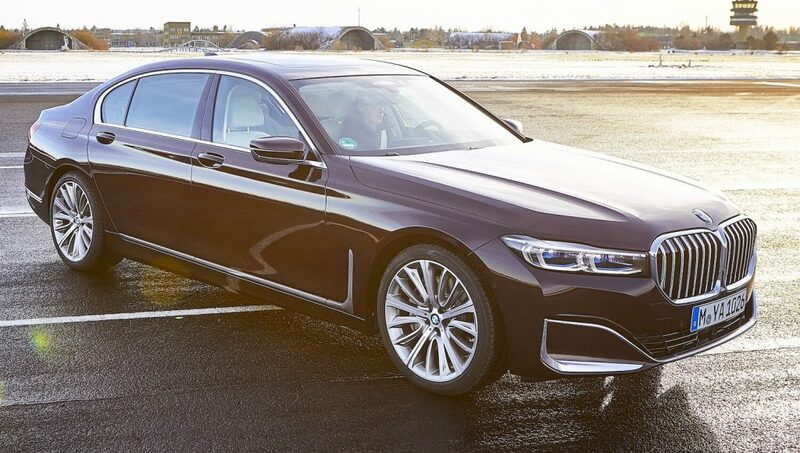 The BMW 7 Series plug-in 745e is on sale from Spring 2019 with prices starting from £76,815.